*Easier to digest if you may be lactose intolerant or have a sensitive gut. Less than 0.03% lactose. 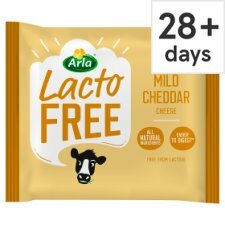 We use rigorous scientific testing to ensure that Arla LactoFree cheese contains no lactose, using accurate accredited tests, enabling us to detect lactose at a trace level of 0.03%. At this level our tests show that there is no lactose present in Arla LactoFree. Keep refrigerated. Once opened, use within 7 days.